Fantastic Result for Charity Golf Day & Dinner! We are delighted to announce that we have successfully raised nearly £10,000 from our Charity Golf Day & Dinner. Fredericks Clients to Appear in BBC Series! Over the summer we were busy filming with our clients for the next BBC1 Series 'A Matter of Life & Debt'. Our clients Furbabies Grooming, Autovogue, Vanilla Pod Bakery and The Garden Shop were selected to appear along with two new clients, K'wors and Back To The Fuschia, who were interviewed at panel and the decision to fund was filmed and will be aired during the series! The Fredericks online community enables all stakeholders to simply and easily communicate with one another, via forums and bulletin boards; and share information about themselves, their products or services, their ideas and challenges, their solutions, successes and user stories. There is a huge amount of knowledge available within our network of volunteers and mentors, that is now available to our clients and will greatly enhance their chance of success. At present our clients tend to be limited to having contact with only two sources of information and advice; Fredericks Foundation itself and their mentor. The Fredericks Community will greatly improve this situation and enable all clients not only to communicate with each other, but also with an extensive network of knowledgeable and experienced business owners who have already faced the challenges that you are facing daily. Fredericks Foundation is very fortunate and honoured to have an extensive network of very willing, experienced and generous volunteers and partners. For a few years now, we have been conscious of the fact that many volunteers have been getting frustrated that we are not making greater use of their time, knowledge and experience. From now onwards The Fredericks Online Community will be one of the main ways that we communicate with our clients, volunteers and partners. Make certain that you gain all the benefits that the community offers you. Membership is free and becoming a member will only take a few minutes. Carly saw a gap in the market to deliver Digital Marketing Apprenticeships in the Buckinghamshire area and TEEG Digital was created. In the first year Carly worked really hard to get the local college to agree to partner with them as her business was too small to have a direct contract with the Government. “We have now been delivering Apprenticeships for around 2 years and although we aren’t a big provider, being small allows us to have personal relationships with all our employers and Apprentices and we are able to deliver a fantastic service and high quality training. Carly was unable to get a loan from banks and other lenders as she already had quite a large overdraft as her business model had changed resulting in her accounts for the previous year not looking healthy enough, so no-one was prepared to take anymore risk. Until she came to Fredericks Foundation! Struggling with anxiety and at times not being able to work properly led Carly to start up her own business. It’s not been easy for Carly and she has experienced really hard times where she nearly closed down due to changes in Government funding. But she never gave up, she just changed with the times which is why she went into Apprenticeships and it was the best decision she ever made! The loan Carly received from Fredericks Foundation will help grow her business to the next level by signing up with an exam board to give the Apprentices their qualifications; re-branding the company; website development; social media campaigns, and exam fees for the learners. Carly is already on her way to success. She now employs a full time Apprentice, uses a team of freelancers and will be employing more staff soon to help with project management and overseeing training for Apprentices, as well as visiting employers and networking to generate business. On Wednesday 17th October we hosted our annual get together for our 1% Club Members where inspirational success stories as well as challenges were shared. Our 1% club brings together socially-minded companies. These companies have pledged to donate 1% of their profits (or more) to Fredericks Foundation. Their philanthropy extends to individual employee support and many have also been able to help us with donations of hardware or software, office space for our clients and support for our fundraising events. We team up to organise ‘inspirational challenges and events’ in support of our ideals. when you shop online this Christmas! 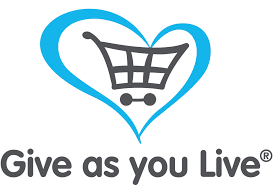 Why shop through Give as you Live? The Give as you Live brand new iPhone and iPad app is packed with more features than ever before - including a fast and intelligent browser search enabling you to shop faster on-the-go. It couldn't be easier to raise free funds on your desktop or laptop via Give as you Live. Simply login or sign up for free on your device, then search for the store you want to shop with using the search facility. Once you've found the store you want to shop with, click on the "Shop & raise" button. You'll be redirected to the stores website where you can shop as normal. Thursday 18th October was the date for the second of two mentor training days held this year. This time the training was held in our Lightwater HQ. The training once again was given by the impressive founder of the ‘Association of Business Mentors’ Kerrie Dorman. 10 volunteer mentors, both male and female attended, and all expressed their great satisfaction with the day. The critique sheets returned so far, indicate that the day was rated 9.75/10 and 100% of attendees said that they would like to return next year for the intermediate level training that we are planning.